JG Thirlwell | Manorexia “Dinoflagellate Blooms” surround sound album out now! 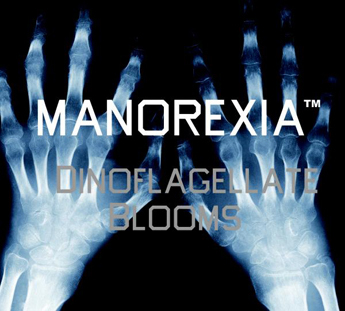 Ectopic Ents is proud to announce the release of the long awaited new Manorexia album, Dinoflagellate Blooms. The album features eleven compositions composed, produced and performed by JG Thirlwell. The package includes a CD of the album in stereo, and a DVD with the album in glorious, immersive 5.1 surround sound. The album careens between soft plucked interludes to full blown symphonic frenzy, from musiq concrete nightmares to cinematic mindfields, with a meticulous marriage of samples and live instruments, distressed sounds and mysterious unknown quantities. You can hear previews of the album here. Begun in Berlin in 2005, the album was recorded at Thirlwell’s Self Immolation studios in Brooklyn, and the 5.1 mixes were made at Harvestworks Studio with Paul Geluso. Manorexia will be performing in October 2011 with Portishead at All Tomorrow’s Parties event in Asbury Park, NJ. Initial quantities come with a free 4×5 Manorexia sticker signed by JG Thirlwell. Available exclusively at foetus.org shop.